Date: 16 March 2015. Windlass Debris becomes Handhold. A few years back I bought one of the greatest inventions for boaters ever: a Lewmar-V700 windlass. It changed for the better my anchoring practices and I'm glad to own it. This is the smallest unit sold by the company. For Seaweed she's just about perfect, except for the debris that came with it. The debris is actually the cheesy backing plate sent with my V700. It's not that it was so awful -- it wasn't. I'd paid a lot of money for the windlass and simply wanted something larger and more substantial to bolt through than what was sent. For a time I looked at and thought about the doggone backing plate. It needed to be useful and I couldn't think of a way to do that. Finally I offered it online (for free) and still, no takers. Eventually I added some little rubber feet to it and called it a trivet. 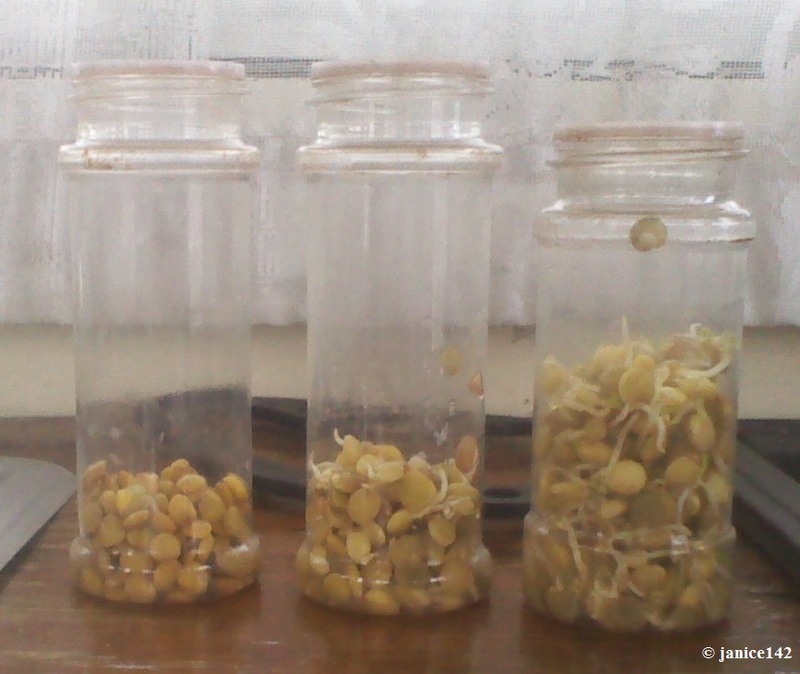 If you're curious the Growing Lentil Sprouts article is worth a look-see. However, after a while I decided that was a bad idea so I pulled off the silicone feet and looked at it. Ugh. The backing plate had potential, but I wasn't sure for what! The backing plate became a part of that mess I dealt with on Pi Day. 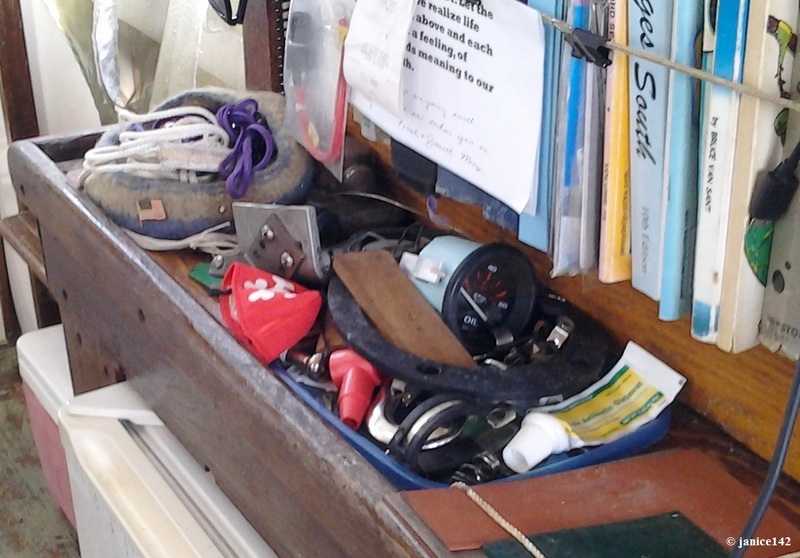 It's the black gizmo with an old oil gauge and a block of wood in it, next to the nearly empty (why did I keep it there?!) antibiotic ointment tube. The medicine now back in the medicine locker where it belongs. The mess including that backing plate had to go from that counter horde of clutter. That's when I had a Good Idea. I've been getting on and off the boat over the transom (not easy without a tuna door) and needed another hand hold. Having a secure place to grab is important from a safety standpoint too. All too often a moment's inattention during boarding or disembarking the boat and an accident can occur. The vessel moves and balance is lost. I don't want to fall and get hurt. Whenever I find myself reaching to some particular place for a hand hold, I make sure I add one right there. I gave it a look see and liked what I saw. It won't be in the way, and I believe the spot chosen will be useful. First I kind of wedged it in, and thought about placement and safety. Would the wood hold up to the stresses of a person off-balance? Next came the drill issue. Mine had finally given up the ghost. No amount of charging would make it go, so I did. I made it go into the trash. It's off the boat and is one less problem. In the meantime, without a drill or Dremel I needed to figure out a way to attach the backing plate to the frame of my doorway. 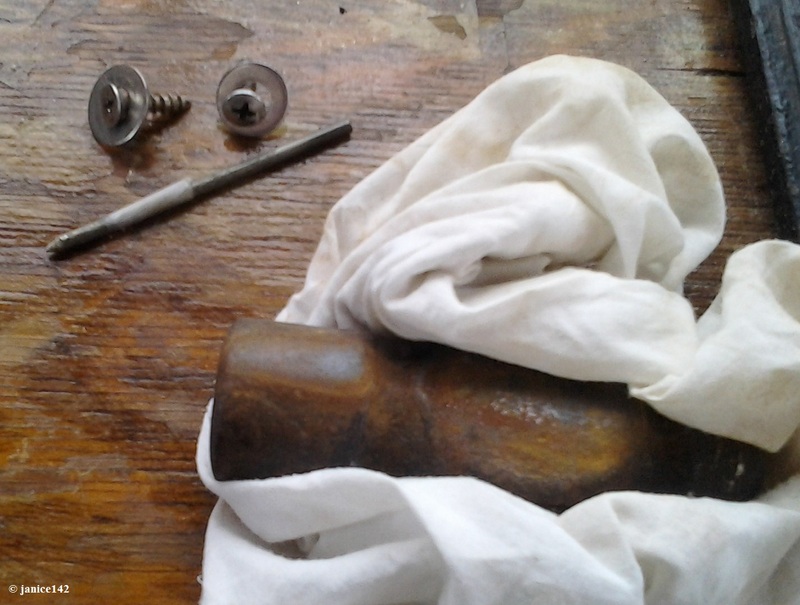 That's when I pulled out my *pokey stick, the head of a hammer and an old work rag. *Pokey Stick is actually a piece of a used welding rod, sharpened to a point. It's a homemade awl and very useful. When walking through a workshop always look for the ends of welding rods. If it is not magnetic it has pokey stick potential. The scraps tend to be the right length (two inches, give or take) and generally there are a dozen on the floor. A grinder will sharpen them up and voila: pokey sticks. Just shy of the length of the screw is the depth I want to drive that pokey stick into my wood door frame. I marked the depth to hammer it in with tape. Normally I'd use blue tape but I'm out right now. The pokey stick is thinner than the thread diameter of the screws. Thus, the screws will tighten well by hand, provided I have enough depth. The wood is hard and since I didn't have a drill nor a Dremel rotary tool I made do with what was aboard. 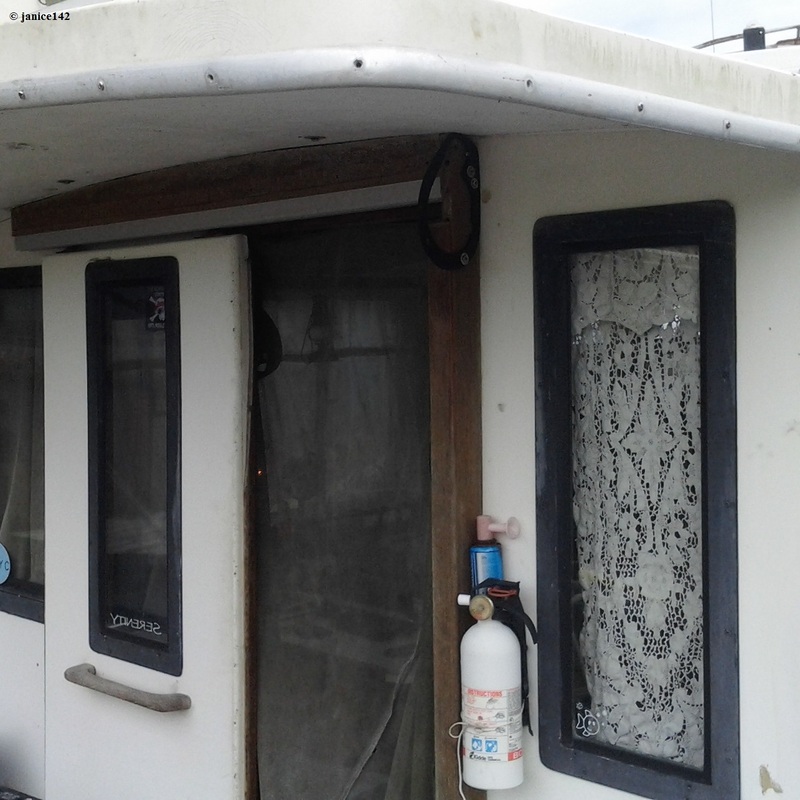 Part of being a successful cruiser is not necessarily having everything on the boat for whatever contingency occurs. Of course that would be ideal. Boating means making what is aboard serve a purpose. Albeit said usage may well be far different from that which was initially intended by the manufacturer. Use your own judgment and always keep safety in mind. The hammer head is heavy (16 penny) which means it weighs one pound. Because I was working so close to the edge of the cabin I thought it best to not use a regular hammer. There's more control for me with a hand held unit. I wrapped it in a disposable work rag so my nails wouldn't get dirty. By using the Lewmar V700 backing plate, I had predrilled holes and appropriately spaced too. You know, sometimes an idea just comes together nicely. This is another one of those times when good fortune was hanging out aboard my miniature trawler. I am blessed. Life afloat is wonderful. I was smiling as I began my preparations for installation. Finally my backing plate would have a function. It will make my Seaweed better and safer. 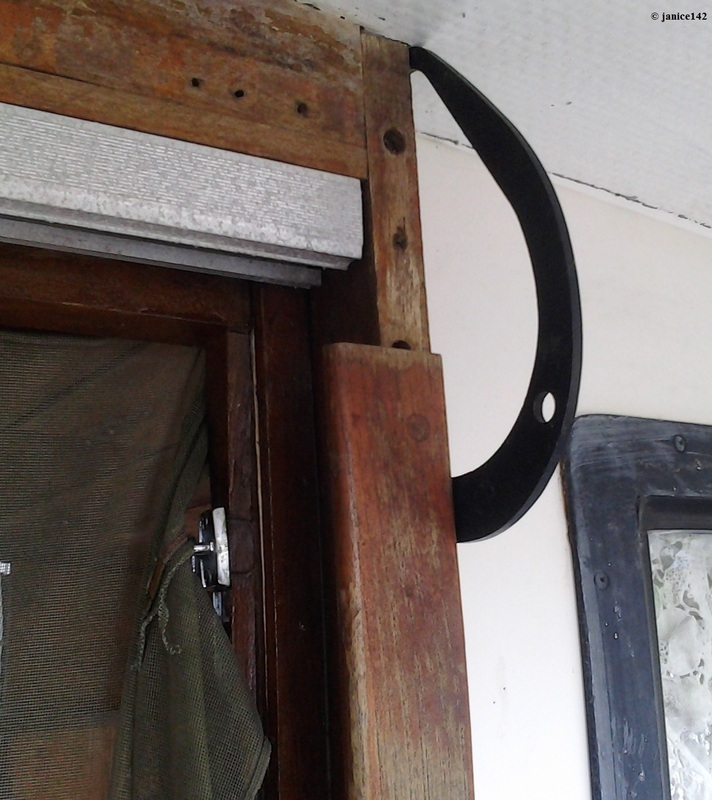 Now I have a handle to reach for when coming over the transom. It's at the top and tucked back a bit so it should not become a head bumping hazard for taller folks. 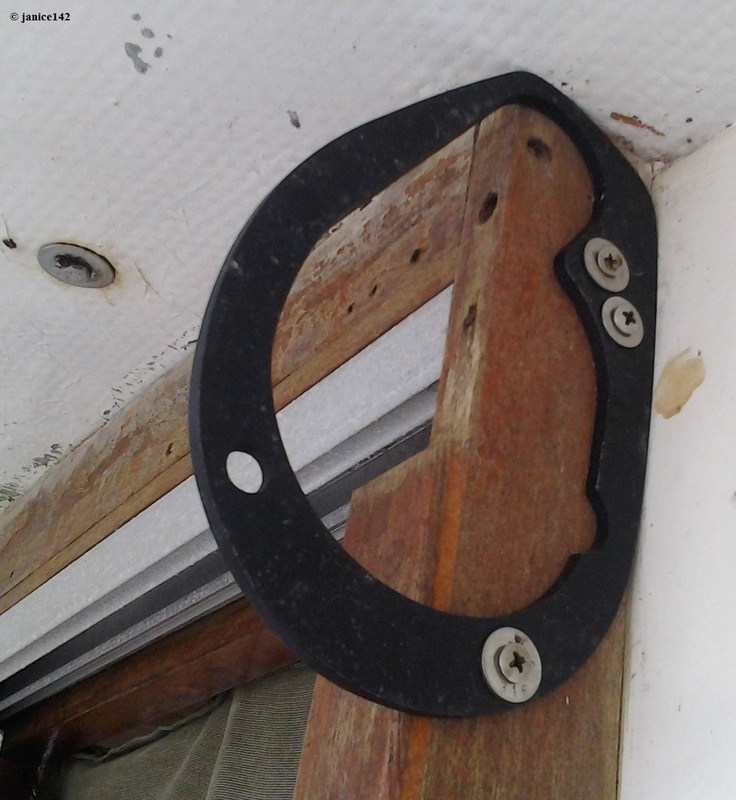 The size of the handle is sufficient that even someone with large knuckles should be able to use it. This is project done, though not to perfection. I forgot to *isolate the aluminum backing plate from the stainless screws. I should have added a gasket between the washer and the new handle. That's got to be done shortly. In the meantime I'm satisfied with the result. 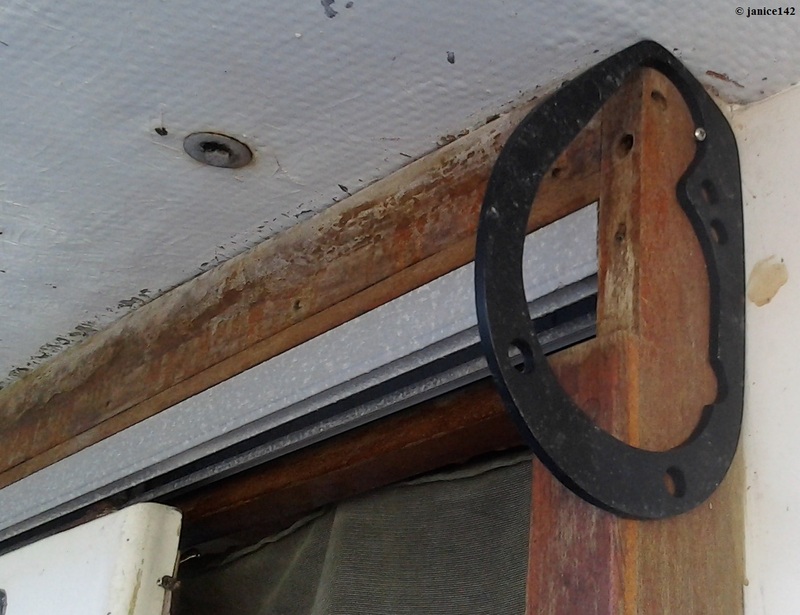 The windlass backing plate now has a useful purpose. *Isolate: When stainless and aluminum come in contact corrosion occurs. Two dissimilar metals should have some sort of separation. Life is good afloat. And aboard Seaweed, it's a bit safer simply by using what was at hand. As a soloist, I am concerned about falling. Are you? Is there anything you do to ameliorate accidents? A favorite aphorism: Misfortunes one can endure--they come from outside, they are accidents. But to suffer for ones own faults--ah!--there is the sting of life! Oscar Wilde.